A large part of invasive s is performed today under ultrasound guidance. The procedure planning and monitoring the needle in the course of invasive procedure requires high skill and allows the insertion of the needle only when it is linked to the ultrasound transducer and on the ultrasound image plane, in order to increase the chances for the needle’s visibility during the procedure. It is almost impossible to perform such procedures when there is an angle between the needle and the ultrasound plane. The TrigGuide system, developed by Trig Medical, includes a computer (or a tablet), a GPS positioning system and a dedicated software. 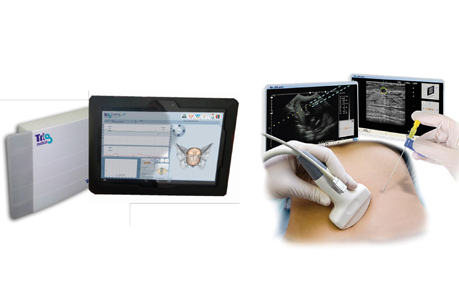 The TrigGuide system may be connected to the video port of any commercial ultrasound device in today’s medical use and displays real-time ultrasound image on the tablet screen or computer screen. Position sensors are attached to the ultrasound transducer and to the needle. The system continuously carries out a real time calculation of the relative position of the needle with respect to the ultrasound plane and displays the needle location upon the ultrasound image in real time. Using a user-friendly graphical interface, the TrigGuide system allows the physician to aim the needle at the target before inserting the needle into patient’s body and see it during in the course of procedure until it reaches the target. The TrigGuide system has an FDA approval in the US, a CE European certification and an approval by the Medical Equipment Dept. of the Israeli Ministry of Health.